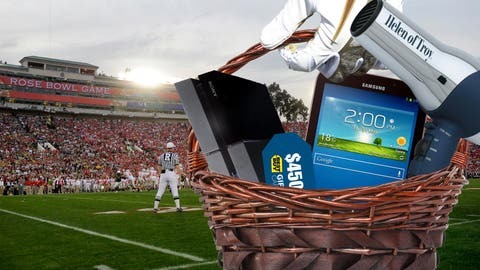 Ready to find out what kind of gifts college football players will get at bowl games this year? College football bowl season is upon us. And while we now know all the matchups, what we’re really concerned about here at The Buzzer are the gift packages that will be handed out to the players at each game. For instance, did you know some bowl games hand out pricey gift cards (Best Buy, Macy’s, etc.) to each player? Or that at one bowl each guy will get a new PS4? Yeah, apparently this is the only way student-athletes can be "paid." Thanks to the folks at Sports Business Daily, we now know all the details on the gift packages. Here are some of the best/strangest gifts being given out (check out all the gifts right here). Famous Idaho Potato Bowl: Tiger Woods Nike Golf beanie and an iPack backpack. The Tiger hat seems like an easy gift to later give to someone for Christmas or their birthday. The iPack is a keeper. Beef ‘O’ Brady’s St. Petersburg Bowl: Samsung Galaxy Tab 3. What, no beef? Sheraton Hawaii Bowl: Tori Richard aloha shirt and a beach towel. Seems fitting. We just don’t know what a Tori Richard aloha shirt looks like. San Diego County Credit Union Poinsettia Bowl: $205 Best Buy gift card and a cap. Who doesn’t want a cap? Oh, and the gift card works, too. Military Bowl presented by Northrop Grumman: Sony PlayStation 4. They’re giving away other stuff, too, but they had us at PS4. Texas Bowl: Samsung Galaxy Tab 3 … and a belt buckle. A belt buckle! Capital One Bowl: $450 Best Buy gift card and shopping trip and Russell Athletic workout shirt. $450! Oh, and a shirt. Bell Helicopter Armed Forces Bowl: RadioShack gift card. They’re also giving away an Ogio overnighter bag and a football … but a RadioShack gift card? That place is still around? Hyundai Sun Bowl: Helen of Troy hair dryer. Yup, this one totally confused us, too. Chick-fil-A Bowl: $300 Visa gift card, Chick-fil-A gift card. Talk about solid. Vizio BCS National Championship Game: Fossil watch; New Era 59Fifty Hat; Oakley Flak Pack XL backpack. Sorry, no gift cards for the guys in the title game. For all the details check out Sports Business Daily.